This is one of the first recipes from our original Restaurant du Village repertoire that we most enjoy where there’s a nip in the air. Mouclade, Mussels Cooked with Cream and Curry means briny mussels, sweet curried cream and a few pieces of crusty bread. It makes the perfect meat or first course with a few friends. Mussels are cheap, delicious and one of the more sustainable types of seafood and shellfish available today. The Environmental Defense Fund and Sea Choice recommend mussels, including the clean, farm-raised varieties, because of their low environmental impact. Heat the butter in the bottom of a deep saucepan large enough to hold the mussels. Add the shallots and sauté them until softened without browning. Stir in the curry powder and cook it gently for a few minutes to release its aroma. Stir in the wine, cream and parsley. Add the mussels and cover. Bring to a boil and reduce the heat to simmer. Simmer just until the mussels have opened. Remove mussels from the pan and place them in a large bowl. Continue to cook until the liquid is reduced and slightly thickened. Adjust the seasoning of the sauce with pepper and salt, if needed. Then pour the thickened sauce over the mussels. Garnish with additional fresh parsley and crisp slices of toasted baguette slices. 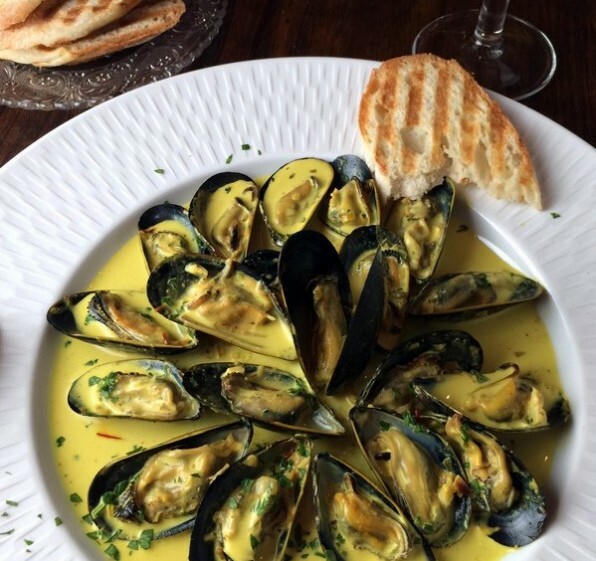 *For less fuss, the mussels may also be served in deep bowls in their shells.